This MAb reacts with all isoforms of CD45R expressed by all hematopoietic cells, except erythrocytes, having a higher level of expression on lymphocytes than on granulocytes. CD45R, also designated CD45 and PTPRC, has been identified as a transmembrane glycoprotein, broadly expressed among hematopoietic cells. Multiple isoforms of CD45R are distributed throughout the immune system according to cell type. These isoforms arise because of alternative splicing of exons 4, 5, and 6. The corresponding protein domains are characterized by the binding of monoclonal antibodies specific for CD45RA (exon 4), CD45RB (exon 5), CD45RC (exon 6) and CD45RO (exons 4 to 6 spliced out). The variation in these isoforms is localized to the extracellular domain of CD45R, while the intracellular domain is conserved. CD45R functions as a phosphor-tyrosine phosphatase. This MAb reacts with all isoforms of CD45R expressed by all hematopoietic cells, except erythrocytes, having a higher level of expression on lymphocytes than on granulocytes (Workshop IV). 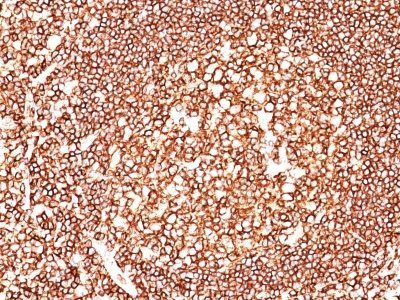 Antibody to CD45 is useful in differential diagnosis of lymphoid tumors from non-hematopoietic undifferentiated neoplasms. 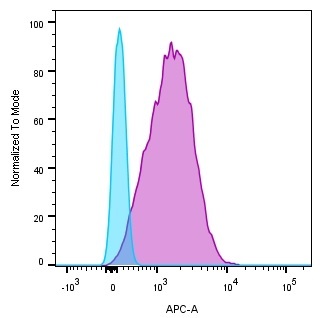 Catalog number key for antibody number 0172, Anti-CD45 (135-4C5) The prefix indicates conjugation, followed by the antibody number and size suffix.